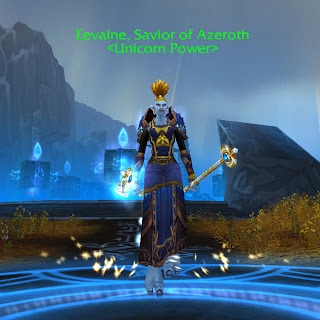 After silently watching several transmog sites and blogs, I've been interested in starting my own. Even as I begin this, I have another monitor open with a toon sitting at the AH because I struggle to pull myself away. The overall bottoms turn into a half skirt, leaving half of whatever skirt leggings you are wearing (or have transmogged) to show. If you are just wearing pants (or just have pants transmogged), this effect does not stick. But for skirts, for whatever reason, you get a half and half. What's working here? I tried to find a skirt with some brown so that the brown line the overalls create wouldn't be so out of place, but the blue of the overalls ended up not matching the other blues. So I found a pair of gloves that matched that blue in an effort to tie it back in. 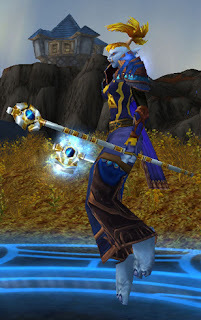 The tabard blue is also too dark, but I'm not a tabard collector at all; it was a desperate attempt to hide the top of the blue overalls. I believe the yellows, golds and browns are actually what is holding this outfit together. I hope you find many fun new combinations with the blue overalls from this. I've seen this "bug" in MogIt and got excited. But when I tried to make use of it I failed. Your idea to go with more brown and gold worked well! And I really like how the skin tone and hair color complete the look. I mean to update this on a weekly basis. And, once I figure out Blogspot a bit more, I hope to get some links going to similar blogs.